In honor of the self-described “best week of the year,” I will be posting on the lives of sharks and the oceans in which they live. Why? Because what they do–and what happens to them and other sea critters–greatly affects what ends up on our plates. As any real Shark Week nerd knows, sharks are truly amazing creatures that are far more than the killing machines depicted in movies like Jaws and in general folklore. We are just beginning to understand the complexities of shark behavior, and we certainly have to appreciate the role sharks play as top predators. Some species pose no threat to humans and are critically important to their respective ecosystems. We are also learning more about how they can help us. They have powerful antibodies that could be recreated and used as medicine for humans. Not exactly the pet you take home... but deserves to be left alone. 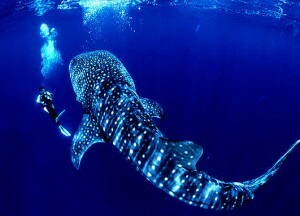 Photo from http://scienceblogs.com/deepseanews/2007/04/whale_sharks_do_it_deeper.php. However, these incredible creatures are facing serious threats from humans. No, this isn’t just from retaliatory kills (i.e. after a shark attack on a beach, which can result in the death of innocent sharks in the area). Humans are also killing sharks through a process known as “finning”; that is, hauling the shark onboard, slicing off its fins, and throwing the shark back in the water–alive. The shark, now devoid of its powerful fins, cannot swim and sinks to the bottom of the seafloor, where it dies. 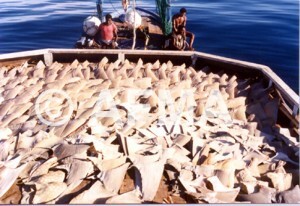 The fins are used to make “shark fin soup,” which is considered a delicacy throughout the world and in China especially. Shark fin soup. Photo from http://www.southernfriedscience.com/?p=5191 (referring back to topnews.in). The first question most people ask upon learning about finning is: “Why don’t they at least kill the shark and put it out of its misery?” The second question usually is: “Why don’t they just keep the shark onboard to use all of it and not waste the body?” Sadly, the answer to both of these questions is: money. Time is money, and the time it would take to kill the shark before throwing it back into the deep blue is simply not worth it to the fishermen. It is also much more profitable to keep the (high-priced) fins and throw the rest of the (relatively worthless) shark meat out of the boat so as to keep the haul light and ready for more catch. So. Why is this on a food blog? Well, maybe you are not one of those people who enjoys eating shark meat, fin or otherwise. Regardless, it is important for us to know how shark harvesting practices fit in with the larger picture of how we catch our seafood. Everything in nature is interdependent for survival; lions depend on buffalo and zebra, wolves depend on caribou, and sharks depend on seals, fish, and other sea animals for sustenance. If we take sharks out of the equation, other populations are affected. Likewise, messing with sea life lower on the food chain is going to affect the health of the shark population that feeds on it. Just as we should inform ourselves about water contamination, factory farming practices, and what the true threats are to our edible plant production (pesticides, GMOs, soil depletion and erosion), we should not forget about the health of the oceans and rivers that we depend on for food. For more on shark finning and shark conservation, check out this interview with marine biologist Randall Arauz in Costa Rica. 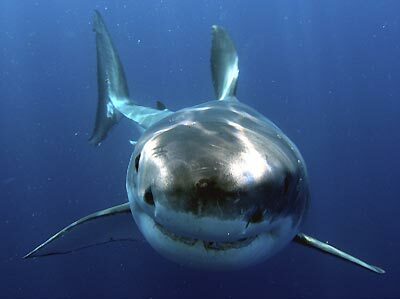 And even if you don’t eat shark fin soup, this is a good week to think about the seafood that we do eat. Monterey Bay Aquarium has an easy to follow, easy to download Seafood Watch Card that lists the fishies that are okay to eat and those that we should avoid, based on fishing and farming practices and population counts. Definitely worth a look!! Thanks to Animal Welfare Institute and SeaWeb for their advice on seafood watch lists. Great post, Urs. Impressive writing. Very convincing. Hugs from NYC. Thanks Doug!! More to come. Hugs back. 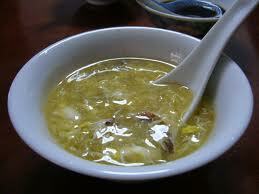 I’ve never had shark fin soup–and after reading that, I NEVER will! Right on Jessie! I completely agree–I wouldn’t be able to enjoy it knowing how it got on my plate!